Over the past two decades, a primary focus of the Ottawa County Parks Department has been its $41 million Grand River Greenway Initiative, with the goal of protecting thousands of acres of natural lands, creating green infrastructure, developing new recreational opportunities, and connecting communities. So far, $20 million in mostly public funding has been invested to preserve over 2,400 of land and create 13 parks and open spaces along the Greenway. Over the next five years, Ottawa County Parks proposes to invest an additional $21 million to acquire 1,000 acres of land and construct 27 miles of new multi-modal pathway. This investment will create recreational, educational, conservation and historic attractions by protecting some the highest quality land remaining along the river, connecting the greenway properties to each other, and completing the most critical remaining unfinished link in the regional pathway system – a trail, the Idema Explorers Trail, connecting Grand Rapids, Grand Haven, and Grand Valley State University. 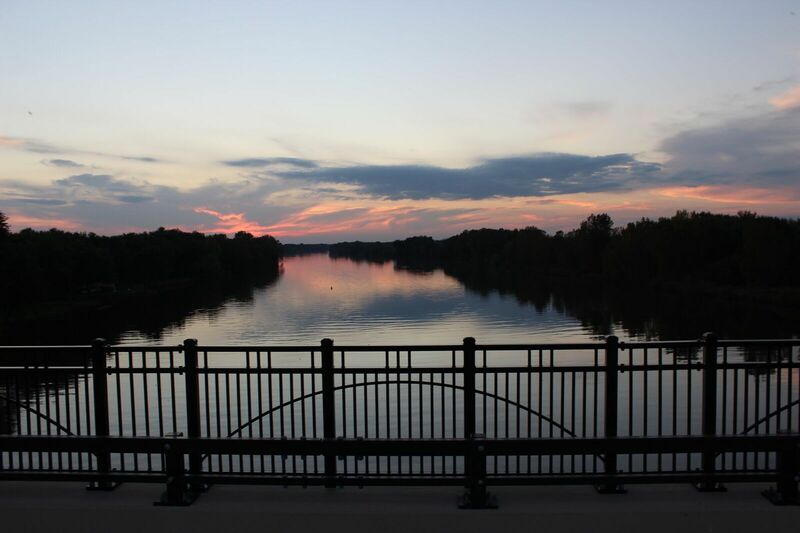 In order to accomplish this, the Ottawa County Parks Foundation is spearheading the Grand River Greenway Campaign, a fund-raising effort to leverage over $10 million in anticipated new public funding. The campaign is in its initial stages, with lead gifts being sought at this time. West Michigan is poised to become one of the premier metro areas in the Midwest. To remain competitive and to attract residents, healthy ecosystems and iconic recreational experiences are needed. The greenway lands and Idema Explorers Trail will offer this type of experience. Furthermore, concern is growing regarding increasing health care costs due to chronic disease, often due to obesity and/or a lack of physical activity, and the rising incidence of mental health issues (particularly among youth). Evidence is mounting that exercise and time spent in nature is needed to maintain physical and mental health. Plentiful natural and public spaces with an extensive non-motorized pathway network connecting communities and park lands are essential to meeting both of these needs. West Michigan’s community leaders already recognize the importance of healthy ecosystems, public spaces, and trail connections. Connections to the lakeshore cities of Muskegon and Holland are nearly completed. There has also been an intense focus in renewing and revitalizing the Grand River. Grand Rapids invested $400 million to renovate the city’s storm water system, allowing the river to recover biologically and culturally. The continuing development of Kent County’s Millennium Park is reconnecting the community to the river. With the GR Forward and Grand Rapids Whitewater plans, the river corridor in the city of Grand Rapids is gearing up to be completely transformed, and could become the city’s defining feature. However, while these efforts are of critical value and regional importance, more work is needed to realize the river’s full potential and complete the regional trail network. Much has been accomplished, though the scale of the accomplishment is not necessarily widely known. In all, there are 8,500 acres of public land on the river between Grand Haven and Grand Rapids. This includes the land managed by Ottawa County Parks, Millennium Park, and the 1,660-acre Bass River State Recreation Area. However, while a trail system connects Grand Rapids to Millennium Park, the rest of the greenway lands have no pathway connections to surrounding communities, nearby amenities, or nearby public lands. The communities on the river between Grand Rapids and Grand Haven are among the most rapidly developing in West Michigan and include valuable regional assets. Georgetown Township is the most populous community in Ottawa County while Allendale Township was the fastest growing township in the State in 2015. In order to address growing traffic demand, MDOT recently completed the $200 million M-231 project near Grand Haven, which includes only the fourth Grand River bridge in Ottawa County. Recognizing the importance of the regional trail network, MDOT invested $12 million to construct a scenic bike path on the bridge. The pathway overlooks the Grand River and pristine marsh wetlands. Additionally, the GVSU Allendale campus continues to expand and is important to the region’s future given the increasing value of higher learning institutions. Until recently, student access to the river and recreational opportunities has been limited, but the development of the popular Grand Ravines Park on the campus’s south side has started to change this. A trail connection to surrounding cities, to the greenway lands (including the first safe connection to Grand Ravines), and to the Grand Rapids GVSU campus would further distinguish the Allendale campus from other regional educational institutions. For these reasons, GVSU enthusiastically supports the Greenway. 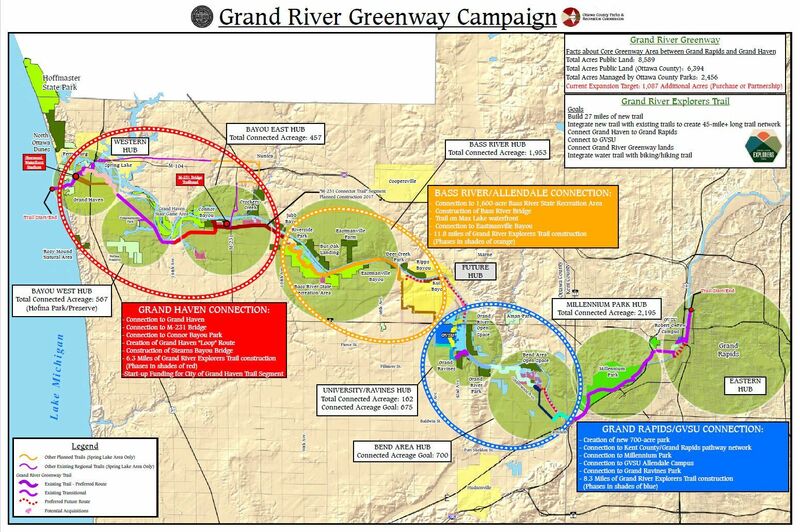 GVSU President Thomas Haas is a Greenway Campaign Committee member and GVSU and Ottawa County Parks are already working closely on the greenway. In fact, GVSU is creating a greenway trail route through campus. An effort of this scale cannot be accomplished without assistance from multiple partners. Ottawa County Parks is working with local, regional, state and federal agencies to assemble over $10 million in public funding, establish the pathway route, and create a consistent wayfinding experience. For the Greenway Campaign, the Parks Foundation is engaging with multiple private/non-profit partners from across the entire region to start the process of identifying the remaining funds needed. The true benefit of the greenway investment will not be realized until key linkages are acquired and a greenway trail is open to the public to enjoy. The completed system will connect 8,500 acres of public land to Grand Rapids, Grandville, Jenison, and two Grand Valley State University campuses to the lakeshore in Grand Haven. 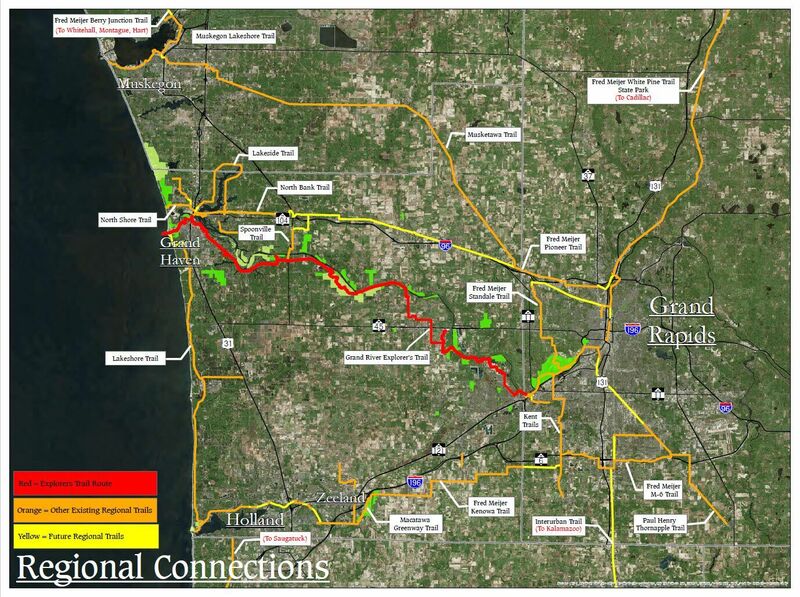 Furthermore, this pathway will integrate into West Michigan's regional trail network, with connections to nine regional trails, including the new M-231 Grand River Bridge. Once complete, the public can explore this 30-mile pathway and the many spectacular parks along the way. Construction of the 3.9-mile paved segment in Robinson Township, along the north side of North Cedar Drive is complete. This segment connects Connor Bayou to Riverside Park and serves as the southern connection to the new M-231 bridge non-motorized trail crossing. Sign up for e-mail updates on this project and more. Check out photos of the progress here. Grand Rapids Business Journal, May 19, 2017: The Ottawa County Parks Commission is entering the final stage of a $41-million project it started decades ago.